w2eu Statement 22.01.2017: No Dublin Returns to Greece! Published on January 22, 2017 in Uncategorized. 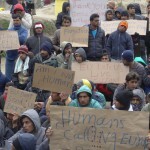 Closed Tags: access to asylum, Dublin III Returns, family reunifications, greece, press release, reception conditions, refugee camps, relocation, struggles and resistance, w2eu statement. 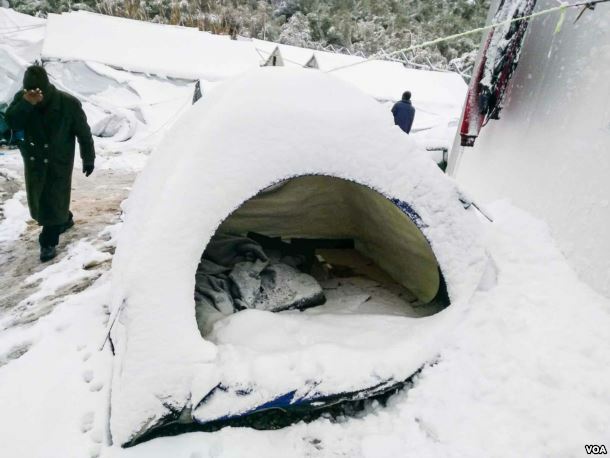 Refugees are exposed to snow and rain while forced to stay in tents and unheated prefabricated houses, some of which are old and have broken doors and windows. Over the last days awful pictures from the “Hotspot” detention-camp in Moria on Lesvos have travelled around the world. This time, small tents, not even sufficient for a short summer rain, were collapsing under the pressure of snow and the heavy rains. These pictures where taken by the inhabitants themselves, only a few days after the Greek Deputy Minister of Migration Ioannis Mouzalas had proudly announced that now most refugees would not have to live in tents any more. But refugees and solidarity people alike rose in anger immediately posting photos and videos from camps all around Greece on the internet, demonstrating the opposite. The ‘Winterization’ project failed, during a time when the EU is asserting that Greece is now a safe place for refugees, able to offer adequate living conditions and proper access to asylum procedures. Greece is not a safe country for refugees. Refugees stuck in Greece are suffering in the inhuman and inadequate living conditions in detention centres and mass camps despite the presence of the UNHCR and numerous international and national NGOs. Refugees lack basic legal rights, access to information and legal aid. They have endured months without access to asylum procedures. They have spent months fighting for their right to stay in Greece while the feasibility of their deportation to Turkey is being examined by the EU’s so-called asylum experts. 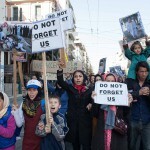 Hundreds were returned without proper access to legal aid for an appeal against the return decision, without a proper examination of their individual persecution in Turkey, without their asylum claim being heard, without a proper examination of their vulnerability, which should exclude them from any deportation procedure. 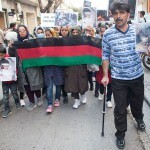 Their lives have been put on hold on the islands of the Aegean and on the mainland by long-lasting procedures of pre-registration and registration. Access to the asylum procedure is yet not secured as the blocked Skype calls to authorities remain the only way to make an appointment, while thousands of families are separated and have to wait to reunite for almost one year. Even Greeks are escaping Greece. And so are recognized refugees as there is no welfare system and no labour market, which could offer on the prospect of a dignified life. Even survival is not secured upon receiving the right to stay in Greece as those recognized are excluded even from state housing for refugees and from most of the social support structures offered by NGOs. May we remind you that Greece is suffering for years from a massive economic crisis and all people living here have to cope with the devastating austerity measures forced upon them by the Troika, by our European governments and institutions. We strongly denounce the EU’s dirty game! The Hotspots are detention centres at the external borders of Europe, meant to select and sort human beings into ‘deportable’ or ‘not-deportable’, ‘migrant’ or ‘refugee’, ‘useless’ or ‘useful’, ‘unwanted’ or ‘wanted’. EASO experts are those who carry out the selection. Frontex is not only the key-institution pursuing militarised controls and the deterrence of “refugee flows” at sea, but also responsible for deportations from the Aegean islands back to Turkey. The Dublin Regulation is a mechanism aimed to keep all refugees at the external borders of the EU. Relocation has failed with only 6,212 persons out of 66,400 successfully moving to other EU-states until the beginning of January 2016 – within the first year of a two-year implementation period. ‘Voluntary’ return is for most people the last choice, and a decision followed the suffering of massive deterrence policies, such as enduring for a year a life in a tent at the rims of Greek society. Refugees give up, finally, preferring to “die at once, than every second again and again” – a sentence that is heard over and over again by refugees in the Greek camps. 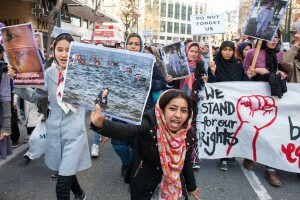 The cruelty of deportations to Afghanistan is obvious, when we see how European citizens are advised not to go there due to concerns for their safety. 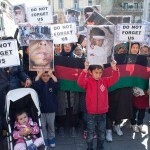 Nevertheless, and ironically, the life-threatening situation in Afghanistan is swiftly forgotten when it comes to the granting of asylum to Afghan refugees. The EU-Turkey Deal is nothing more than the result of the blackmailing strategies of a dictator, using Europe’s desire to keep refugees out as leverage. But Dublin will fall again! 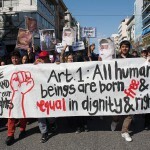 Deportations to Greece were already once stopped back in 2011 following the decision of the European Human Rights Court in the case ‘MSS v. Greece’ – and as a result of a long struggle during which many, many refugees escaped from Greece, were deported and escaped again. Some had to flee through Europe 5-6 times. But finally it was over, they succeeded often, and stayed. Published on April 3, 2016 in Syndicated. Closed Tags: antifascism / antiracism, detention, fortress europe, greece, hunger strike, new detention regime, repression, struggles and resistance, turkey. 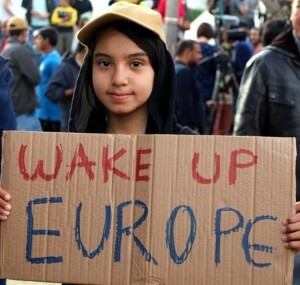 Since the dirty deal between the EU and Turkey was made on 18th of March the situation in Greece worsened rapidly. Safer formal ways through the Balkan-corridor were closed down already before by the European governments while more than 50,000 refugees are caught up inside Greece. 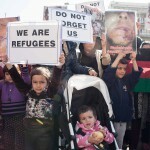 More than 90% come from war torn countries such as Syria, Iraq and Afghanistan and the majority are women and children. More than one month after the closure of the border to FYROM / Macedonia they are still under shock by the sudden changes unable even to consider alternatives such as relocation, family reunification or asylum. They cannot realize and accept that this is the new reality they have to confront, with everybody being stuck in limbo under inhuman conditions in refugee tent camps all over Greece. 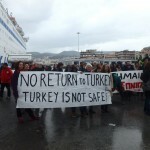 From Monday, 4th of April, on the return agreement with Turkey will be implemented with more than 500 people being readmitted from the Hot Spots on the islands of the Aegean which have been turned into detention and deportation centres in practice. Only the ones applying for asylum or family reunification and unaccompanied minors will not be deported back to Turkey. Asylum applications since a few days have reached unprecedented peaks while the Asylum Service is not able to deal with the many applications. Statistic concerning Asylum applications in Greece 2016 and Hellenic police statistics illegal migration according to nationalities 2016 first 2 months: 61022 Syria, 32776 Afghanistan, 21907 Iraq. 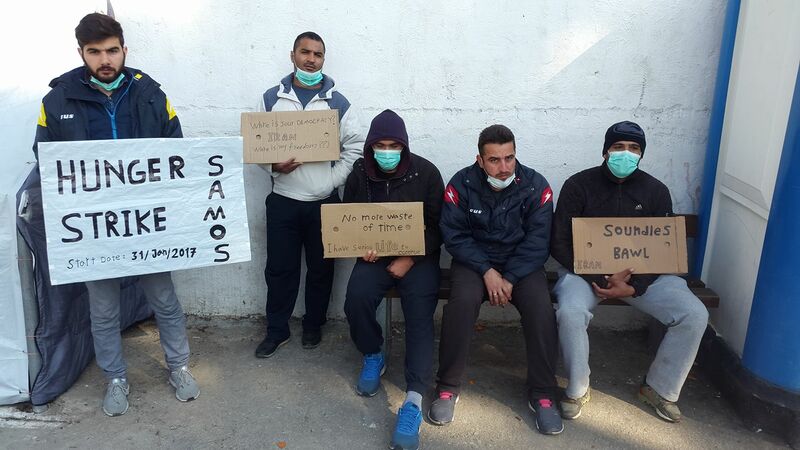 Resistance against deportations in the hotspots on the Greek islands started already: in Moria, Lesvos, the Hot Spot that is totally overcrowded with more then 2,000 detainees a group consisting mainly of Pakistani refugees started a hunger strike. They belong to the five nationalities that are already affected by the more than 700 readmissions that were conducted since the beginning of the year. 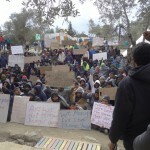 In “Vial”, the Hot Spot on Chios, half of the people escaped after a revolt on 2nd of April from the closed camp and marched to the port of Chios city where they are staying since then. They are protesting and demanding their freedom of movement in order to travel further on. Today again another protest was started in Vial by mainly Afghan refugees against their deportation. 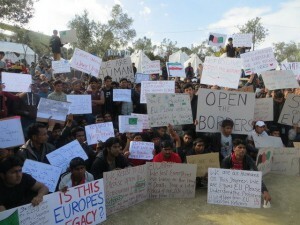 In Athens demonstrations for open borders took place already twice with hundreds of refugees most of which were Afghans, a major group within the refugee population who can not take part in the relocation program and who are largely excluded from the few possibilities of adequate reception conditions. In several open camps on the mainland protests within the last week refugees all over Greece demanded open borders as well as for better conditions in the camps. Already since several weeks solidarity structures are being increasingly criminalized suffering repression by the authorities and exclusion from different official refugee agglomeration sites. We declare our deep solidarity with all the people who have been since months on the ground, struggling for the rights and dignity of those on the way and a lot of times for their mere survival. The example of Lesvos, which was for the last year the island with the highest number in arrivals, shows how an amazing amount of solidarity and the many support structures could create a welcoming atmosphere even in the hardest conditions reacting immediately to emergency situations contrary to the formal structures of the government, UNHCR or many bigger NGOs. Published on March 22, 2016 in Uncategorized. Closed Tags: 2016, chios, EU, greece, struggles and resistance, summit, turkey, Vial. 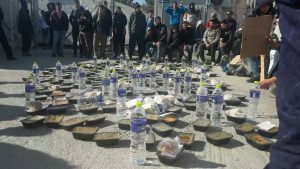 Today, on Tuesday 22nd of March, in the afternoon, hundreds of refugees locked up in the new detention centre and former fabric “Vial” on Chios island started a protest raising their voices against the new Fortress Europe. They continue their struggle for freedom of movement as they became the first refugees affected by the new cruel detention / readmission measures following the dirty deal between the EU and Turkey. Thousands of refugees are now behind bars directly after they survived the dangerous journeys by boat while simultaneously volunteers and many NGOs were kicked out of the former Hot Spots. At the same time UNHCR and also Medicines Sans Frontiers (MSF) left the camps openly critisizing the new system as unfair and inhumane. Published on March 20, 2016 in Uncategorized. Closed Tags: 2016, Afghans, athens, demonstration, greece, struggles and resistance, transit camps. 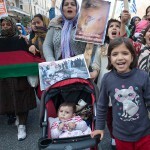 During an antiracist rally that started from Victoria Square in the centre of Athens and passed the Greek Parliament to reach the Offices of the Representation of the European Commission in Greece, hundreds of antiracists along with many Afghan refugees demanded the opening of the border, protection and a safe passage instead of deportations. The Afghans came from different transit camps as Elliniko and Schisto. Freedom of movement is everybody’s right! Published on March 15, 2016 in Uncategorized. Closed Tags: 2016, afghan, greece, living conditions, protest, reception conditions, relocation center, Schisto, struggles and resistance. 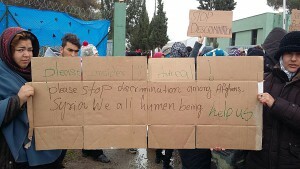 “We need a solution!”, says Mohamed an afghan refugee who protest together with other refugees from Afghanistan in front of the camp Schisto in Attika Region. “Our papers are to expire! 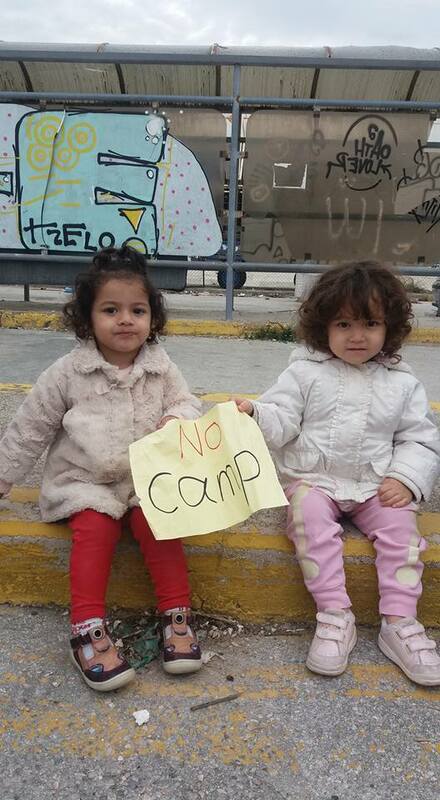 We demand from the Greek government to renew them for one month more. Otherwise we will get illegalised and they might detain us here or even deport us back”, he says. Published on March 10, 2016 in Uncategorized. Closed Tags: 2016, athens, demonstration, greece, Idomeni, Notara26, Orfanotrofio, Schisto, squat, struggles and resistance, Victoria. 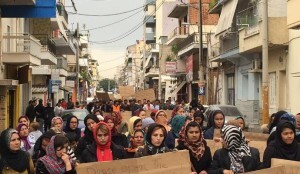 In the past two weeks protests of refugees and supporters are growing over all of the country as the border to the Balkans was closed and thousands are stuck in Greece. From the Hot Spot in Moria, to the transit camp Schisto near Athens, Victoria Square, Thermoupolis, Kozani to Idomeni – people are standing up and demanding the opening of borders. 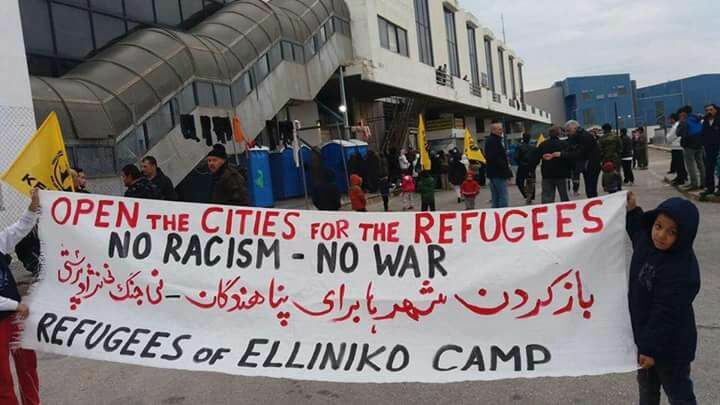 Solidarity is further sprouting in all over Greece with the sixth refugee housing squat opening yesterday in Athens at Kaningos / Kapodistriou in the centre of Athens. “open borders – open houses” it says on a banner outside the building. 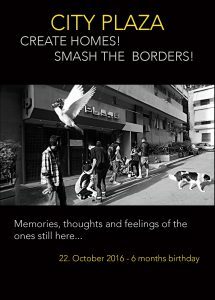 One of the first squats which opened to host refugees was Notara 26 / Exarhia on 25. September 2015. In the former building of the insurance fund ETAM, which had been empty for years activists at first provided for 35 places. Meanwhile more than 120 are hosted there as needs grew rapidly. A priority is given to families and minors. Papers are not any matter to be accommodated. In the beginning refugees stayed 2-3 days only transiting Athens to move on to the Balkans fast. Nowadays with the Balkan corridor closed, refugees stay out much longer. Activists try to find longterm solutions for people hosted long time to be able and offer rooms also again to newcomers. 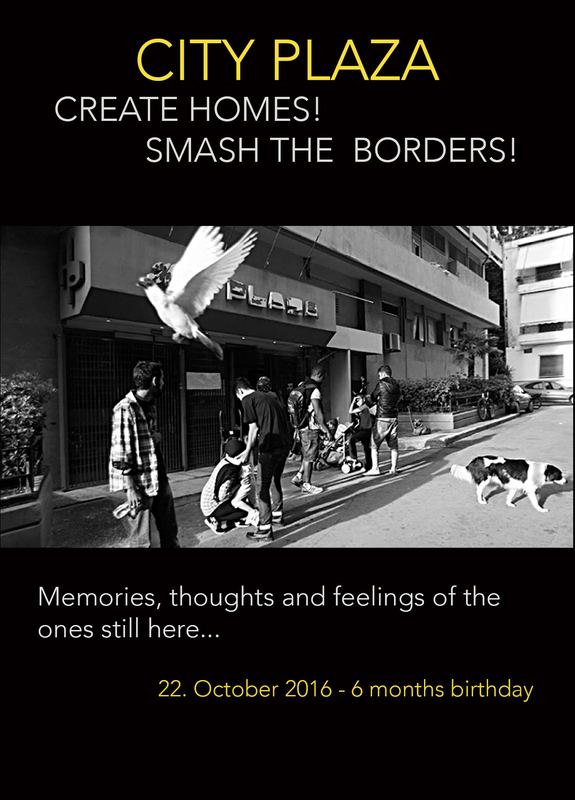 The squat is running now for months with the support of activists and donations only. In beginning of December Orfanotrofio (the orphanage) opened in Thessaloniki when more and more refugees got stuck in Idomeni at the border to FYROM following the limitation in allowing the border crossing only to Syrians, Iraqis and Afghans. Later on in February 18 also Afghans were not allowed anymore to cross until recently when the border was closed to all. The orphanage fits about 100 persons. In Athens in January Themistokleous 58 / Exarhia opened with about 40 places. 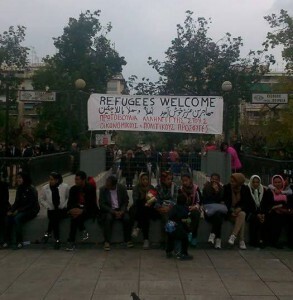 Another squat was established in Patrizia with about 18 places for refugees and in the end of February the gates of the famous Athens Polytechnikums were opened. The last available number of hosted refugees was 70. The number is growing. Published on February 29, 2016 in Uncategorized. Closed Tags: 2016, birder, greece, Idomeni, struggles and resistance, teargas. Police tear gas masses. Many children suffering.